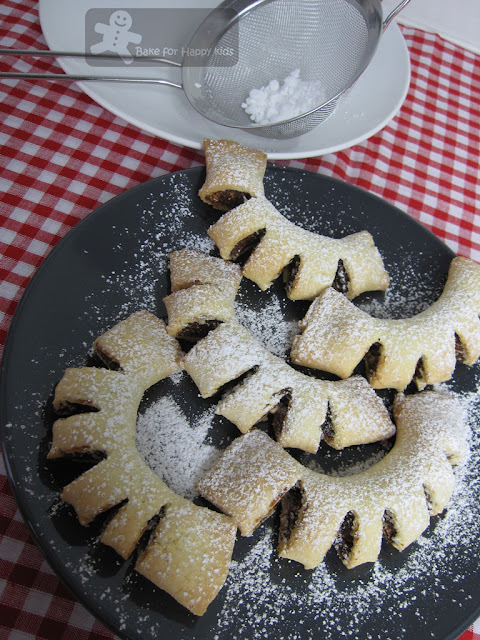 They are traditional Sicilian Fig biscuits that are great for the coming Christmas season. 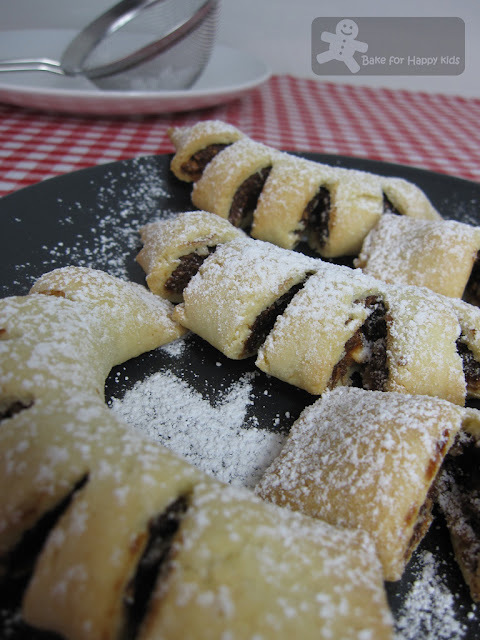 This recipe is so easy that I made the filling and pastry on separate days, stored them in fridge or freezer (not for the filling because I don't prefer to freeze chocolate) and can assemble them whenever I want...It works well for me. Put figs, nuts, sultanas, choc, honey, zest and spices in a food processor and pulse until smooth. set a aside. Put flour, sugar, baking powder and butter in food processor and pulse until coarse crumb forms. with motor running, add milk and process until dough forms. Turn out dough into lightly floured surface. Roll out to form a 10 cm wide rectangle, then trim long edges and cut into 6 cm wide strips. Put 1 tbsp of filling along center and fold over each piece of pastry. Press to seal, then snip flat edge in parallel cuts. Put on trays and bend a little to exposure filling. Bake 20-25 min or until golden. Cool completely on wire rack. Dust with icing sugar and serve. I used half the ingredients and made 14. Figs are so delicious and these look to good to pass up. I will put them on my baking list of things I need to bake. It looks so pretty. Love the combinations of the dried fruits, nuts and dark chocolate - bet it is very tasty. They look so cute! I'm not a fig fan, but I suppose you can substitute with other dried fruits as well. I like the last picture and the plate .... stoneware? I like the shape of your biscuits, it looks so pretty! Haven't eat this before,but i could imagine sure it taste delicious. I really like their shape. It is so unusual plus chocolate and figs which are very dear to me. This looks good! Wonder if I have time to bake this for Christmas this year... Thanks for sharing. I like the look of this cuddureddi dun let him eat too much ya. i'm not sure if i love to eat this..thinking of the figs but i must tell you that looking at the photos, they look simply gorgeous! Yum! I love fig-filled baked treats :) I saw a recipe for fig crumb bar cookies a few weeks ago and I've been thinking about baking with figs ever since! They remind me of the arnott's pillow biscuits I used to get as a child but I imagine these are immensely more delicious. I'm glad that everyone like these cuddureddi. No-Frills Recipes: I'm pretty sure that you can substitute all the dried fruits in the recipes to the ones that you like. I'm not too sure if the plate that I use is stoneware. I got these ordinary dark colored plates from Harris Scarfe, Australia. Amy: Sultana is dried grapes. They are like raisins. I Google for any difference between sultanas and raisin and the answer is "Compared to a regular raisin, a sultana is lighter in colour, sweeter and more moist, and less acidic." cute shape. never seen this kind of cookie before and i think "fig" is uncommon here in my country. what if i change it with dates? 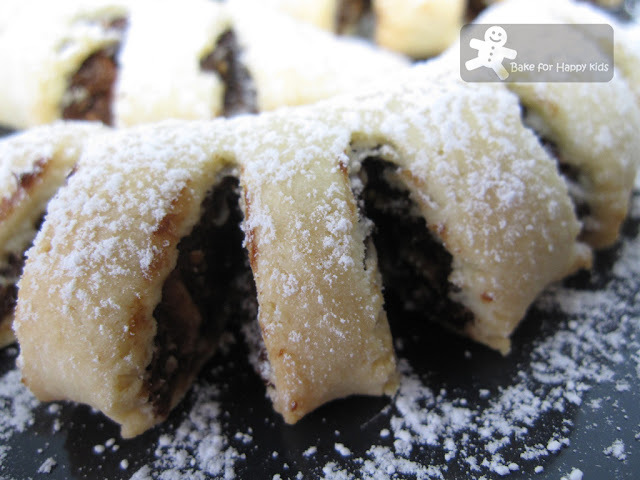 Hi Wenny, I have not tried making these with dates before and I reckon this recipe should work well with dried dates. As dried figs are less compact than dried dates, I suggest maybe you might to soak the dates in boiling water for a longer time. Have fun experimenting!